EraInfo: Vai uma TV da Nokia ai? Vai uma TV da Nokia ai? Não sei se tem relação com a empresa da Finlândia, mas eu passo. "Finnish Rubber Works established its factories in the beginning of 20th century nearby and began using Nokia as its brand. Shortly after World War I, Finnish Rubber Works acquired Nokia Wood Mills as well as Finnish Cable Works, a producer of telephone and telegraph cables. These three companies were merged to form Nokia Corporation in 1967. The new company was involved in many sectors, producing at one time or another paper products, bicycle and car tires, footwear (including Wellington boots), personal computers, communications cables, televisions, electricity generation machinery, capacitors, aluminium, etc." 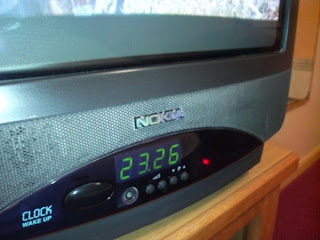 As televisões da Nokia não eram lá muita coisa. As botas de borracha continuam boas. Valeu a informação completa Sami.